↑ Reuters (August 16, 2018). 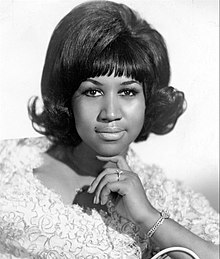 "'Queen of Soul' Aretha Franklin dies at home in Detroit aged 76". The Jerusalem Post. สืบค้นเมื่อ August 17, 2018. ↑ Fekadu, Mesfin; Itale, Hillel (August 16, 2018). "'Queen of Soul' Aretha Franklin has died". Associated Press. สืบค้นเมื่อ August 16, 2018. ↑ "Barack Obama Reacts To Aretha Franklin's Death". สืบค้นเมื่อ August 16, 2018. หน้านี้แก้ไขล่าสุดเมื่อวันที่ 25 มกราคม 2562 เวลา 23:19 น.